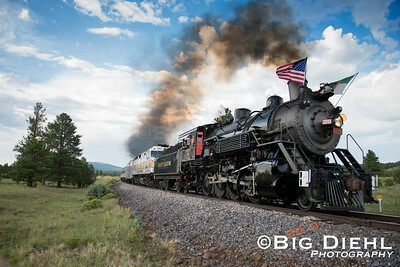 In early 2016, in preparation for the upcoming National Park Centennial, Grand Canyon Railway decided to pull it's long mothballed consolidation #29 from display and return her to service. 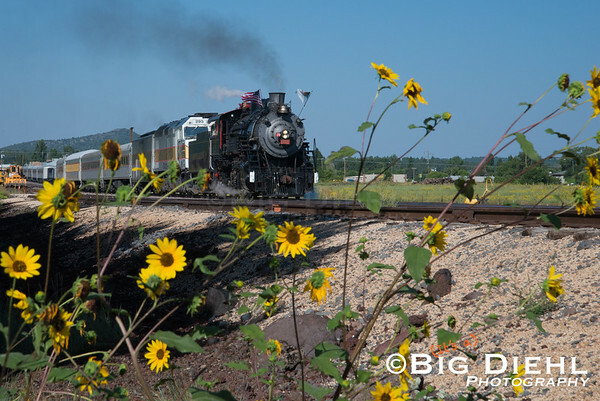 For the first time since 2008, the GCRy would be running two of its steam locomotives at the same time, and over multiple days. 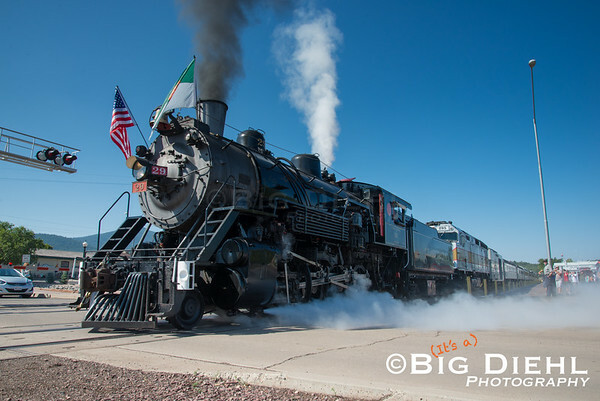 Seen here in this gallery are the first runs of 29 since 2008 pulling the "Williams Flyer" to and from the Grand Canyon on August 24, 2016, followed by the 4960 taking over duties the following day. The 29 has had a long life story of coming back. 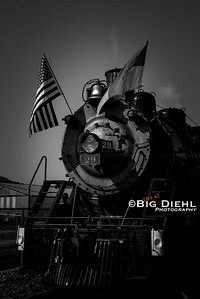 Originally built in 1906 for the Lake Superior and Ishpeming Railroad in Michigan. 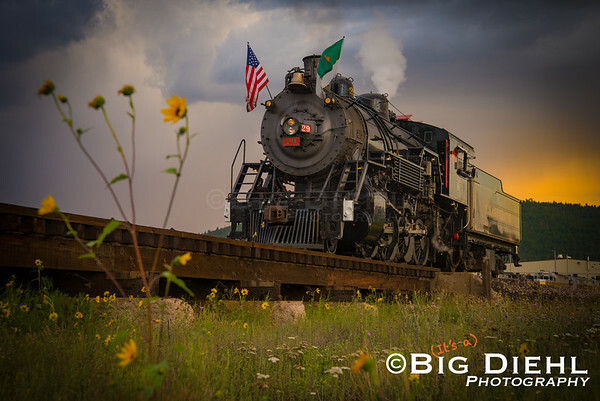 When that railroad dieselized, she was left for dead, though picked up by a short lived tourist railroad, she never ran until the Grand Canyon returned her to operation. From 1990 until 1995 she pulled trains with her old running mate, LS&I 18, when the boiler certificate ran out. 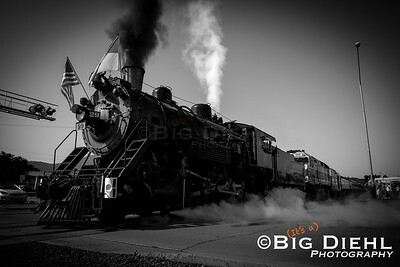 During this time the railroad brought out a thoroughly rebuilt 4960, and with a reduction of the steam season on the GCR from year round to a Memorial to Labor Day schedule, there was seemingly no need for the extra locomotive. When the 18’s boiler time ran out, the 29 was brought back with a thorough rebuild, including a new pilot and other changes. Subsequent modifications which included a Lempor exhaust (and a new stack) along with a new feedwater heater changed her looks even further, but brought her to the same pulling power as the bigger 4960. 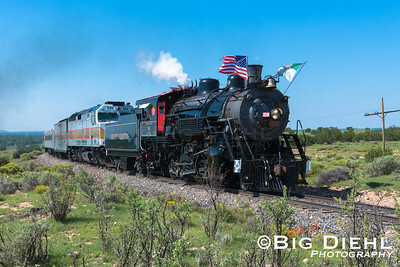 When the railroad was sold in 2008 to the Xantera Corporation, the successor to the Fred Harvey Company, the upper management of the new ownership “dropped the fire” on the steam program, dropping the fires on both 4960 and 29, and dispersing decades of collected knowledge of steam locomotives to the far winds, Over time, the railroad brought the 4960 back to life, albeit on a limited schedule, until 2016, when the company brought the 29 back into service in celebration for the National Park Service’s Centennial in August of 2016. 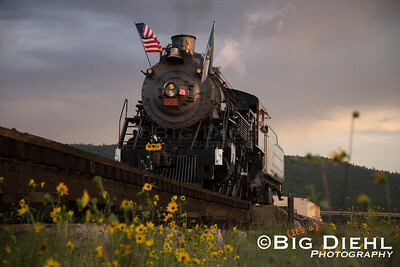 Here we see the 29 on ready to pull her first revenue train in 8 years, flying both the American Flag, and the flag of the NPS. First Scheduled Train in 8 Years. 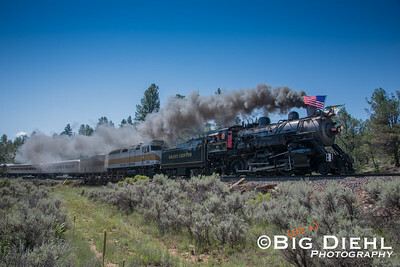 Roaring at track speed at Quivero, the 29’s diminutive 48” drivers are spinning to keep up here as the track speed is a blistering (for a tourist railroad) forty miles an hour. Behind the 29 is one of the railroad’s former Amtrak F40FH’s (now re-geared for freight speeds) to help with the grades. 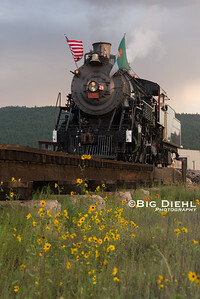 If the railroad was like the next twenty miles north, this engine would be able to pull a train of ALL the GCR’s “Harriman” cars and still have capacity for more. 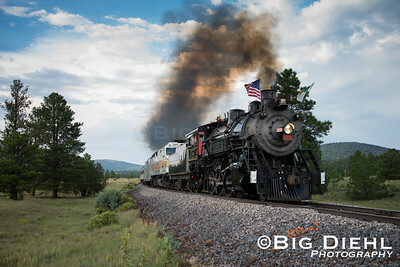 The railroad is not flat though, including a stairsteping climb up the “Apex Grade” that will limit the 29 to 370 trailing tons, or about six cars, and this train is nine, including a very heavy Budd Full-Length Dome car. 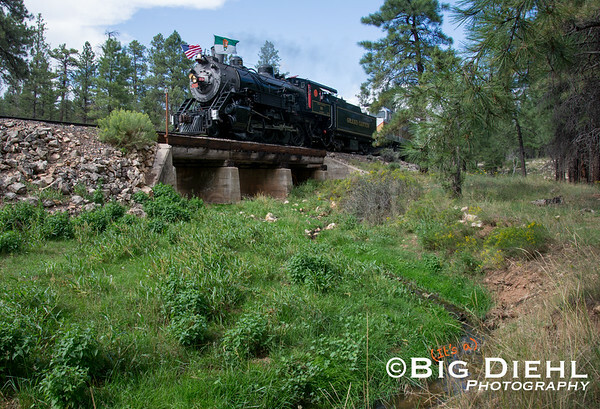 Snaking its way at the bottom of a curving canyon, the 29 and train passes the abandoned siding of Coconino near the National Park Boundary. 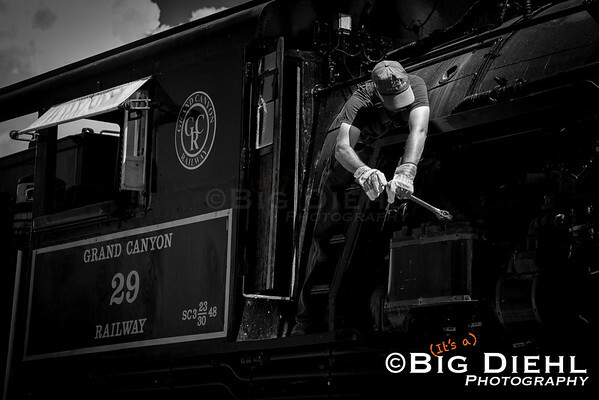 Grand Canyon Railway's Chief Mechanical Officer, Eric Hadder wrenches on the feedwater pump on the side of 29's boiler after a problem cropped up during the trek from Williams. Nearly twenty years into his career at the GCR, Eric has held nearly every position with the railroad on the operations and mechanical side of the railroad, including: Dispatcher, Hostler, Engineer, Road Foreman of Engines, Locomotive Engineer, and now CMO. Across the Mighty Bright Angel. Southbound towards Williams, the 29 rumbles over Bright Angel Wash. A perennial steam at this location now, it's all man made. The Grand Canyon itself lopped off the headwaters to this stream bed when the canyon was formed. Then why is there water here? A nearby sign is a clue, "Reclaimed Water: Do Not Drink".. 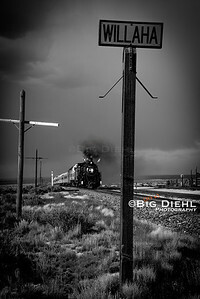 Roughly midway though the journey, the southbound train passes the siding at Willaha. 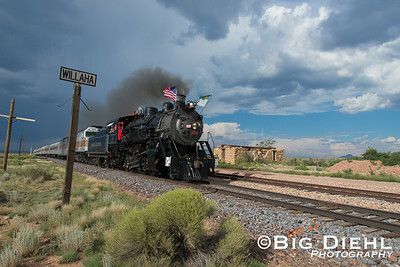 The last major hill before Williams, 29 climbs out of the Dogtown Wash drainage to finish the run into Williams. 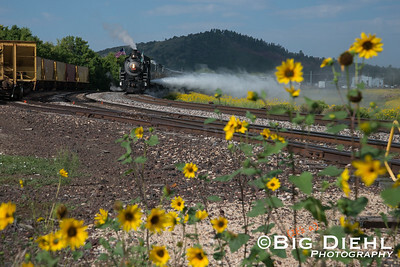 Headed to the shop, while one of the firemen get the switches behind her, 29 sits on the low trestle just north of the railway shops, where instead of water, wildflowers flow. It only took eight years for the 29 to return to steam. 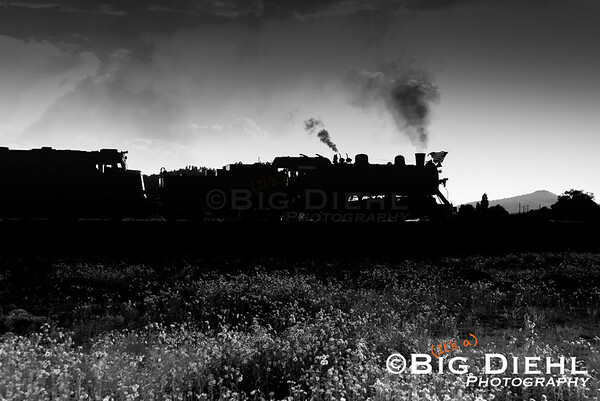 Steam locomotives must be "blown down" regularly to prevent sediments and scale from building up in the boiler. 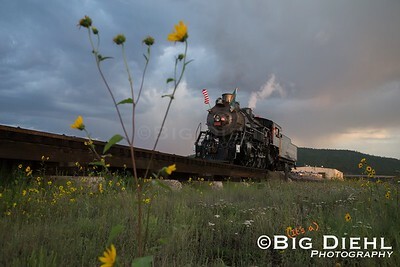 Here we see 4960 blowing down as she pulls the train out of the yard.